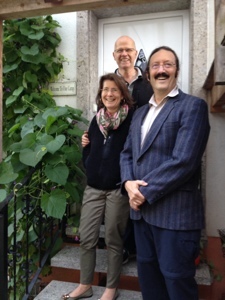 Living the nice life in Bavaria – ever wonder what it would be like to live in a village of 450 souls? Well – that’s where my German friends live – and like most dreams – the reality is always a bit unexpected. 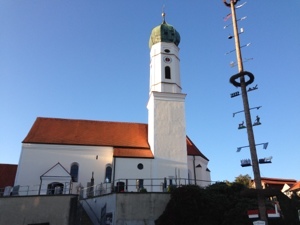 Their village is about an hour outside of Munich – but almost directly off the auto-bahn – so it’s a fairly easy drive into the city. There’s no public bus system to speak of in that area – but BMW, being the good employer that it is, provides bus service for their employees on demand. Nice, eh? So getting to and from work is not as challenging as one might imagine. What is challenging is the lack of shopping. There are no shops of any kind in the village – if you want even a container of milk, you must drive to the next village to get it. It’s only about 5 minutes driving – but for those of us who live in the city – that’s a long way. Apparently there was a shop – but it closed. Just not enough business to be viable. Another challenge – and this is one of those good/bad things – they know everyone. Really well. And they have a strong group of really good friends within walking distance. That’s nice – I don’t know my neighbors – so the idea of having friends so close is incredibly appealing. And they party hardy! Birthdays are a cause for huge celebrations – so large that one of the farmers actually built a room for everyone to use when they have a get-together. And they gather months prior to the party to plan the entertainment. They’ve done Can-Can numbers, written songs based on popular music – We totally cracked up on their version of ‘In the Navy’ – which had much to do with potatoes… Since it was in German, I’m sure we missed most of the jokes – but the recurring theme of potatoes was very obvious. And seriously funny. Of course – you don’t get along with everyone – and in a village of 450 – it’s hard to avoid seeing someone who perhaps you are not that fond of. I guess avoidance is a skill you learn when you live in each others faces – all the time! Because they live far from the city – they have a back yard. It’s small by North American standards – but fairly large by European Standards. There’s a vegetable garden, a flower garden – and a wonderful pond. 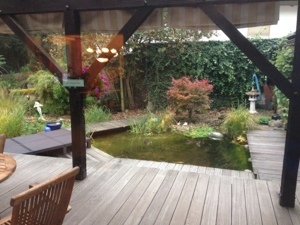 Helmut has built the pond himself. It’s complete with a 4 foot high water bubbler/fall, countless frogs in season, and 20 fish. There are several sections to the pond – the 10 or so smaller fish tend to live in one part, the very large fish in the deeper portion. 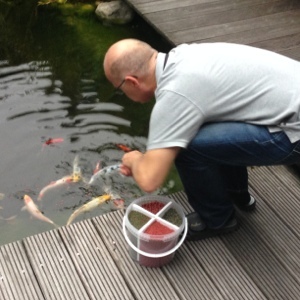 The pond freezes over in the winter – but Helmut assured us that the fish have no problem surviving, the water is deep enough for them to keep it from freezing completely. Like any pet – the fish respond to Helmut – and come when he calls – probably because he’s got the food! Their home is lovely – and we were lucky to be invited to stay with them. The home is new by European standards – built around 1970. It has 3 floors – a full basement, the main floor with a tiny kitchen, huge living and dining area, and the top floor with 3 bedrooms and another bathroom. What makes it distinctly different from what we’d expect in North America are the windows – that open at the top or at the sides depending on how you turn the handle. Another surprise – the size of the kitchen – they don’t even have a full-sized fridge – just a 1/2 size one. The full size fridge is in the basement. Because shopping requires planning – they also have a freezer in the basement. I would guess that farm houses would be larger – but this is more of city home, just located in the country. About the food – being Eiser’s – we travel from meal to meal. And breakfast at Andrea and Helmut’s was great. And based on what we’ve been having at hotels since then – completely normal for this part of Germany. Eggs are offered, there’s at least 2 kinds of breads (it’s Octoberfest – at least one is a pretzel), jam, butter, meat slices and cheese. I visited a market and picked up fruit to add to the meals – fresh Strawberries, Figs, and pears. For dinner – if we’ve eaten in – we had wurst. Different kinds of wurst – but awesomely good. And one night we just had bread and cheese – naturally at least 4 different cheeses of course. And Beer. Lots of Beer. And Liquor. Can’t complain about the food. Andrea is a great decorator – and unlike me – for her less is more. So each room reflects their love of Adventure travel – that is how we met them of course – with simple yet beautiful displays of all the wonderful things they have collected on their trips here and there. My favorites were the memories of Africa – an adventure we shared with them. Because it’s a village – walking around is expected – but sidewalks are not provided. No need – there are hardly any cars. In fact, the only moving vehicle we saw in our hour or so tour was a tractor! Their village has a church, a May pole, a lovely cemetery, and a huge farm – owned by one of Helmut’s very good friends. We were able to get a great tour of a working farm – by the farmer. Cool. 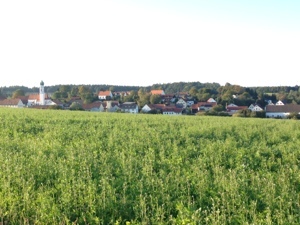 It turns out that our friends live in the Hops growing area of Bavaria. I didn’t know this prior to our visit – but 70% or more of the hops grown to make beer in Germany is grown right near their home. We arrived just after the hops harvest had been completed. So we didn’t get to see the hops on the vines – they had been harvested, separated from the stems, and packed for shipping. But we did get to see the equipment they use today to harvest the hops – and we toured a Hops Museum. Germany controls the stuff that goes into their beer – in a big way. A law passed in 1516 restricted what can go into German beer – just water, barley and hops! The newest research in the ‘Hops’ field is on how to naturally get the hops to have different flavors. No joke – apparently the hot new thing is raspberry Hops. As you can easily imagine – having a law this strict – and given the amount of beer brewed and consumed in Germany alone – makes Hops growing a very big deal! Hops farmers do very well financially – despite the intense effort involved. And apparently the quality of the hops is key to the flavor of the beer. There is a lot of competition among the growers as to whose hops is the best. It’s a bit like growing grapes for wine – but without the cachet! Hops are vines that grow vertically – up to about 30 feet high. 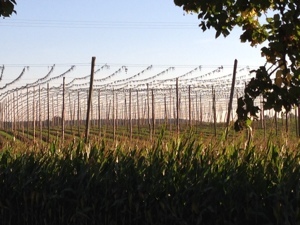 So hops farms look a bit like telephone pole farms – there are poles stuck in the ground about every 10 feet – and between the poles are strung wires. In the fall, the farmers tie down wires about a foot apart – these wires are then tied to the hops plants. As the hops plants grow in the spring, the farmers manually train the plants to run up these wires. In the fall – machines cut down the wires, shake the hops seeds off the stems, grind up the stems and wires – and spit out the hop seeds into huge bags. These bags then go to the breweries to be further processed on their way to becoming beer. 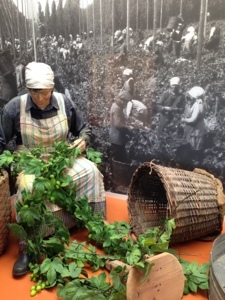 This picture – taken at the Hops Museum – shows the old-fashioned way of getting the seeds off vine. Today of course they use a huge machine. Our friends told us that most hops farms are still family owned and operated, and providing good incomes. The major concern – hops from China of course. What made our stay with Helmut and Andrea so special – in addition to the great conversations and wonderful tours they took us on – was the chance to see how other people really live. Too often our visits to other countries are restricted to museums, hotels, and restaurants. We were lucky to spend 4 days and 4 very alcohol fueled nights enjoying a life style very different from our own. Truly a wonderful part of our trip to Germany. ← 3 Museums – One Day – Don’t do it!